II loved Helprin’s prior novel, Winter’s Tale (1983), but have read nothing else until now. His latest, In Sunlight and in Shadow, is similar in tone, there’s a magical feel to the book, it’s about New York City and about love and death and criminality. 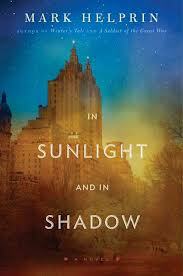 But In Sunlight and in Shadow is also about WWII and … well … it’s about a lot of things. I loved Helprin’s prior novel, Winter’s Tale (1983), but have read nothing else until now. His latest, In Sunlight and in Shadow, is similar in tone, there’s a magical feel to the book, it’s about New York City and about love and death and criminality. But In Sunlight and in Shadow is also about WWII and … well … it’s about a lot of things. Harry Copeland, a veteran of WWII has just returned home from the front lines to New York City where he promptly falls in love with a very wealthy and beautiful Catherine Hale, the only child of the very prominent Long Island Hales, William and Evelyn. And Catherine falls in love with Harry, but their path is strewn with obstacles. 1. Catherine is engaged (since childhood) to Victor, a somewhat older man and family scion in another very important banking family. If they were to marry it would be an “arranged” marriage, but Catherine falls in love with Harry. So Harry has to save the damsel. He does so, but this enrages Victor. 2. Harry owns a small and upscale leather company which has been doing been poorly for a variety of reasons. The manager, a black man named Cornell, has essentially run the company since his father’s early days and is a close friend. Now there seems to be some new criminal “protectors” on the block, squeezing Harry to the point of bankruptcy – or death? 3. Harry is Jewish, Catherine is not. How can a bankrupt Jewish man with any self-respect marry a very rich Protestant woman? But they have her parents’ blessing, they have their love, they have New York – what could stop them? 4. Victor seems to have connections with a large number of less than upright New Yorkers and Victor wants revenge. Catherine is vulnerable because of her budding stage career, Harry because of his business. That’s the front story – the back story is that while he was in WWII Harry picked up some skills and a small group of “talented” friends. The basic story was good. The writing is good. The characters were stupid. So then we come to Catherine’s struggles to believe in herself, in her talent. The critics have scorned and then ignored her – is it Victor’s doing or not? She looks to books and art for courage and faith. Bottom line – this could have been a much better book had it been shorter and somewhat less over-written. It’s baggy and saggy and draggy in places. The main characters are so too good (sensitive war hero meets beautiful, pure and courageous heiress) that Helprin is required to spend hundreds of pages fleshing them out to something other than cardboard cutouts. It gets pretty boring. The bad guys are so bad (Mafia thugs of the worst sort and upper class crooks) that almost no time at all is spent on their warped psyches – they’re stereotypically vile. Period. I think more magic would have helped.